(Lincoln, Neb.) 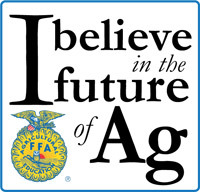 – October marks the beginning of the annual I Believe in the Future of Ag fundraising campaign. This campaign helps local FFA chapters raise money for innovative projects in their classrooms, leadership programming, community service projects and field trips to advance agriculture education in their schools. The Nebraska FFA Foundation, along with eighteen corporate sponsors, will provide extra incentives to participating FFA chapters. This year, $23,000 in matching funds will be distributed to chapters proportionate to the percentage of dollars raised. The local campaign runs through January 31, 2014. To make your donation, contact your local FFA chapter or go to www.neffafoundation.org. For more information about the campaign, contact Stacey Agnew, Nebraska FFA Foundation Executive Director, at 402-472-5846 or stacey@neffafoundation.org. The mission of the Nebraska FFA Foundation is to enhance quality agricultural education/FFA programs in order to achieve excellence in leadership development, curriculum innovation and scholastic advancement of students.